Tube TV is a free Windows 8 YouTube app that lets you access YouTube videos on your Windows 8 PC and play them back to back. Though its not a client app for YouTube, it allows you to search and play YouTube videos in continuous manner, like the way you watch videos on TV. You can create your own video playlists and if you don’t create one, it autoplay videos back to back, without bothering you to play next video when the current one finishes. 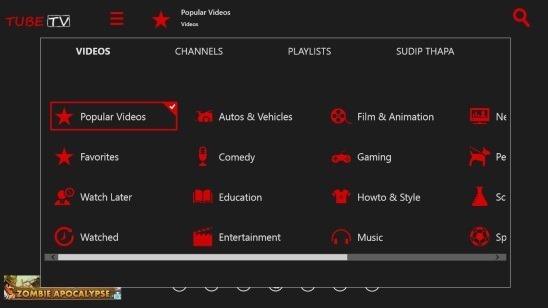 To use this free Windows 8 YouTube app, all you have to do is select a category, channel, playlist, or a subscription (which you have made with your YouTube account) from a list that you’ll get within the app. The moment you select a category, all the videos under it gets played automatically. Now you can just sit back and enjoy YouTube as the way you do with TV. 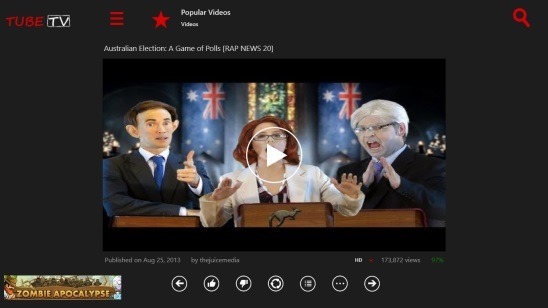 This free Windows 8 YouTube app gives you the best way to enjoy YouTube videos. Tube TV comes with all common video playback options. Besides just watching videos, you can also login to your YouTube account and create a playlist of videos, like/dislike a video, share a video link with your friends, comment on a video, or add a video in the Watch Later list. If you spend a lot of time in watching YouTube videos, then you must get this free Windows 8 YouTube app installed on your system. 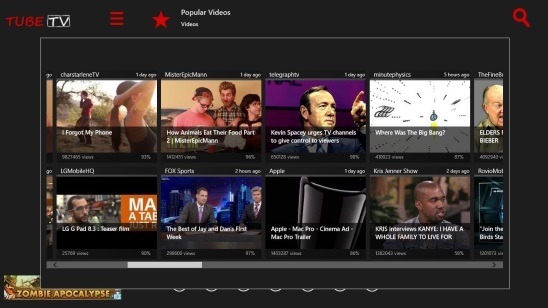 You can get this free Windows 8 YouTube app under the Music & Videos Category in Windows Store. Like I said before, Tube TV is a Windows 8 app to watch YouTube videos with autoplay feature. That means, instead of manually having to play each video that you want to view (like you do on most of the other YouTube client apps and on YouTube website itself ), you just have to specify the category or video search term in the beginning; Tube TV automatically plays videos back to back for you. This free Windows 8 YouTube app is a single screen app, but that doesn’t stops it from being a well made Windows 8 app. It comes with lots of excellent features and a good concept. Since there’s not much required from your side, therefore watching videos is very effortless. The moment you launch the app, you’ll get the Main Screen (the only screen of the app). This screen is well designed, you won’t get any disturbances while watching videos. In order to get the different categories, click on the Menu Button at the top left of the screen (just above the video). The categories included are: Videos, Channels, Playlist, and Sign In. Each of these categories further contains their sub categories, such as Videos contains: Popular, Film & animation, Sports, Music etc. ; Channels contains top YouTube Channels; Playlist contains the playlists that you created within the app, and Sign In contains the subscriptions and playlists that you created with your YouTube Account. Simply click on the desired category and the app will start playing its videos. Note: The Sign In option is basically to link your YouTube account with the app. By doing this, you would be able to access everything you have on your YouTube (web) account, like your playlists, favorites, subscriptions, etc., within the app itself. Now the beauty of the app here is that you can login to your YouTube account and create a playlist of your favorite videos, and besides that you can also make a playlist locally without logging in or add a video to Watch later. Also the app automatically opens with the Top YouTube videos as your default playlist, so there’s no way that you are going to miss any video which is highly trending now. Just select a playlist or channel, switch to full screen mode and sit back, get relaxed and get entertained. Also check out these free Windows 8 apps that we reviewed earlier: Givit: App for Video Sharing and RealPlayer Express: Real Player Client App. Great as a Windows 8 YouTube app. Plays the videos in continuous mode by default. 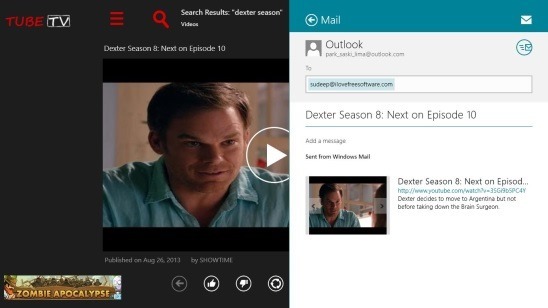 Integrated with Windows 8 Search Charm to search for particular channels, playlist, or videos. Integrated with Windows 8 Share Charm. Different Categories containing popular videos. View Video details and comments with one single click. Can also comment on videos. Live tiles in Windows 8 start screen. Options to create playlists and add videos to Watch later. Follows a screenshot of sharing a video link with friends using the app. Tube TV is one good Windows 8 YouTube app. It’s functional and has good UI. It’s free, quick, and easy to use because everything is present on one screen. Although ads are there, but that won’t be an issue since they are barely visible. Watching continuous videos and that too in HD, is a great experience. And if you get bored there’s always this option to switch to some other channel, playlist, subscription, or category. 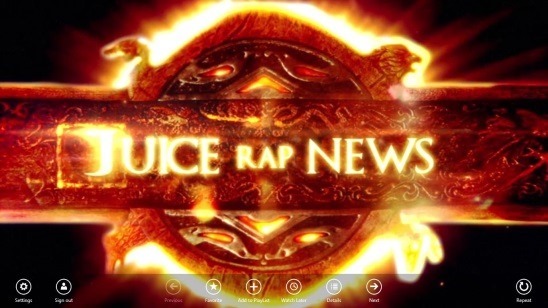 You might also like this free Windows 8 app to listen to YouTube audio.